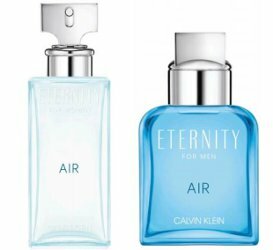 Calvin Klein has launched Eternity Air and Eternity Air for Men. The new fragrances are flankers to 1988's Eternity and 1989's Eternity for Men. Eternity Air for Women ~ a fruity floral. "Creating a new, fresh, Eternity Calvin Klein signature, the Eternity For Women Air Eau de Parfum captures all of the different shades of the atmosphere with sky of the sky accord - airy, yet dense - like the soft breath of a pulse. A structure built around contrasts, based on an unusual blend of natural airy and energetic sensations. Inciting an exhilarating freshness. Eternity For Women Air encapsulates the essence of sensuality and the unwavering bond of everlasting love." With grapefruit, black currant, sky of the sky accord, peony, muguet, pear, cedar, ambergris and skin musk. At Ulta. Available in 30, 50 and 100 ml Eau de Parfum. Eternity Air for Men ~ a fruity fougere. "Creating a new, fresh Eternity signature, the Eternity Air male and female fragrances capture all of the different shades of the atmosphere with sky of the sky accord (airy yet dense), like the soft breath of a pulse. The two fragrances share a similar structure built around contrasts, based on an unusual blend of natural airy and energetic sensations. Inciting an exhilarating freshness, Eternity Air encapsulates the essence of sensuality and the unwavering bond of everlasting love." At Macy's. Available in 30, 50 and 100 ml Eau de Toilette. Either I have a fundamental misunderstanding of both earth sciences and biology, or Calvin Klein’s brief writers do. What a time to be alive. LOL — true, although airy but dense is not a bad way to describe a heavy ozone accord! Since I hate(d) the original Eternity, I will steer clear of these! It is strange but I can’t really remember Eternity! Obsession I do remember.